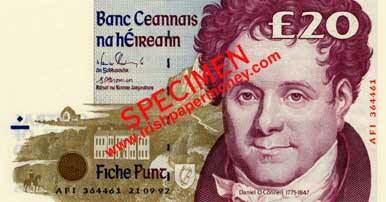 The C Series Central Bank of Ireland started with the rarest date of the series! The first date of the Twenty Pound note, 10.09.92 was a surprise when it appeared—we were expecting 21.09.92 to be the first date. It is likely that this date before the first standard issue date (21.09.92) was done as a trial run of the new design. The print run was around 60,000 (against 12,000,000 notes per date normally) and the date exists only as a replacement note, with prefix BBB. Series traced to BBB 067695, with 21.09.92 replacement commencing at BBB 061089. 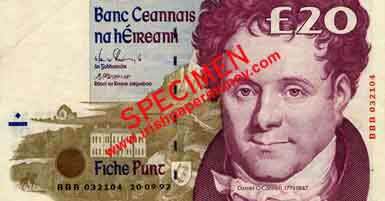 C Series, Central Bank of Ireland Twenty Pounds first dates. BBB 10.09.92, a date preceding the first official date of issue. Interestingly, 10.09.92 also correlates with the very first Irish £20 note, dated 10.9.28.